A ROMAN Catholic group of missionary nuns yesterday sounded alarm bells after a woman and her daughter, both human rights activists, were allegedly taken to a military camp from their home in Macabalan, this city, on Monday. The Rural Missionaries of the Philippines in northern Mindanao identified the activists as Gloria Jandayan and her daughter Gleceria Balangiao of Barangay Macabalan. Tenioso Balangiao Jr. told reporters that his daughter Gleceria and wife Jandayan were taken by one Army Capt. Lorefel Judaya at around 10 am. He said Judaya told him that his wife and daughter were merely “invited” to a military camp in Manolo Fortich, Bukidnon for questioning. The missionary group said Judaya is an intelligence officer. Balangiao said Judaya did not show any court warrant and merely promised that his wife and daughter would be brought back immediately after they have answered some questions. The mother and daughter were brought first to the barangay hall of Macabalan for record purposes before they were taken by Judaya. 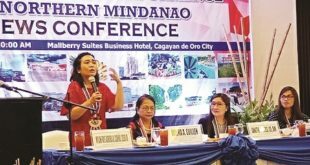 Apus said Jandayan, a member of the group Gabriela, also serves as a barangay health worker who helps indigents in need of medical assistance in the Northern Mindanao Medical Center through the Makabayan bloc in the Lower House. He said Gleceria is a member of Panday Bulig and works for the Rural Missionaries of the Philippines in northern Mindanao. Jandayan, according to the Rural Missionaries of the Philippines, has been accused of serving as a medic of the New People’s Army. The group said Jandayan and her daughter demanded to see an arrest warrant but Judaya allegedly failed to show any. According to the group, Judaya was insistent on bringing Jandayan, and Gleceria opted to accompany her mother to ensure her safety. The group said that as of 10:30 am, Gleceria was able to send a message that they were being held at the Army camp in Patag, and their cellphones were about to be confiscated. Nothing was heard from them since. 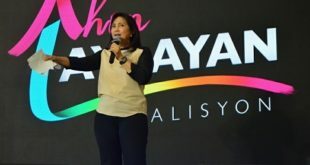 The missionary group, Karapatan and Balangiao said they were worried that Jandayan and her daughter have suffered the same fate of militant group leaders Jomorito Goaynon and Erenio Udarbe, and four members of the Misamis Oriental Farmers’ Association who were arrested on separate occasions in Patag, this city, and in Villanueva, Misamis Oriental. They were charged with illegal possession of firearms and explosives, among others.